PDF Suite provides a set of utility functions for better working with PDF files. PDF Suite is a comprehensive editor that is strong on easy-of-use and meeting your different needs. It helps you to get the most from your documents with its well-designed useful features. It lets you easily merge,split, extract, insert, extract image, convert image, extract text. 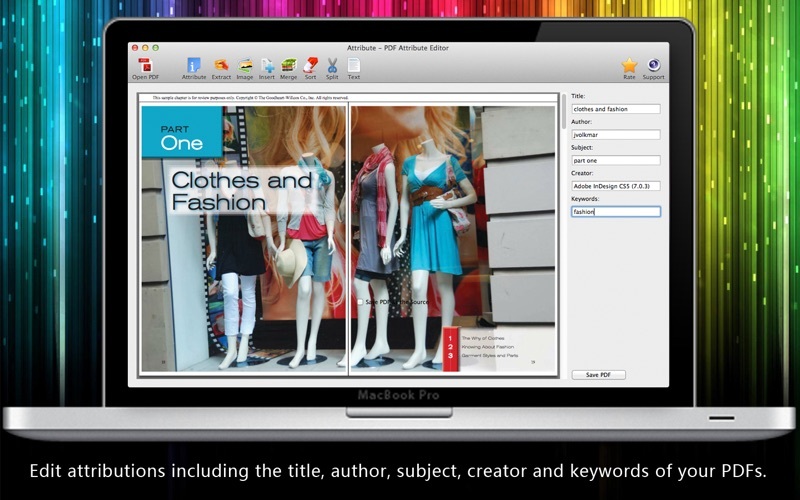 Edit attributions including the title, author, subject, creator and keywords of your PDFs. 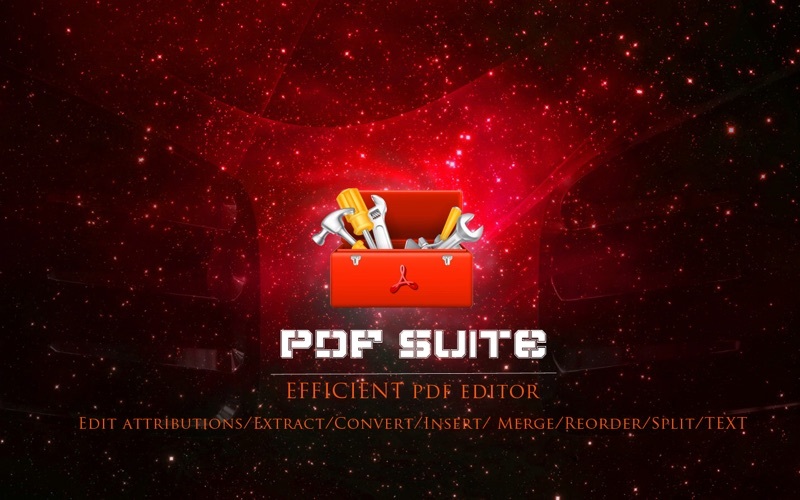 You are able to save PDF file in its original file even after you modify its attributions. Extract selected pages from one PDF to another PDF. Convert PDF files to JPG, BMP, GIF, PNG, and TIFF. Insert Image files to PDFs. Supported image files include BMP, JPG, GIF, PNG, and TIFF. 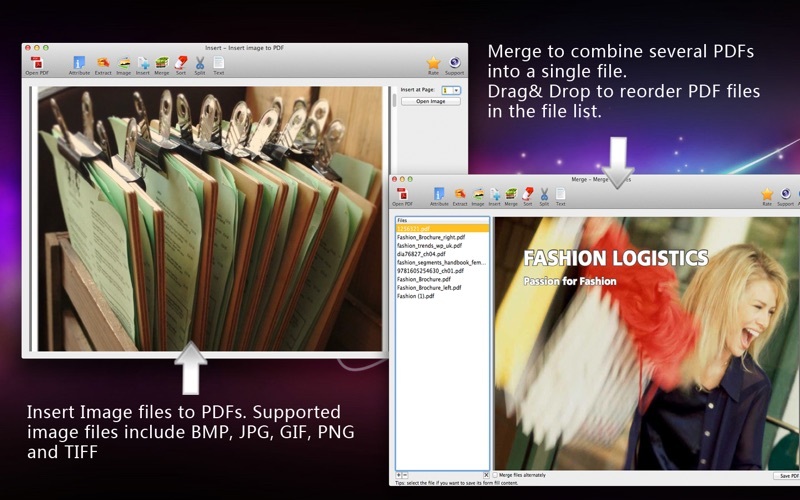 Merge multiple PDF files into a single one. Reorder the pages of one PDF file. Split one PDF file into two separate PDF files. You can select to split PDF pages alternately. Convert PDF files to TEXT files. -Right click a PDF and open it with PDF Suite. Drag & drop PDF files to PDF View. -Click “ATTTIBUTE” to make multiple modifications of the PDF. -Select needed pages and click “Extract” to form another PDF. -Click “Image” to convert PDF file to Image file. -Click “Insert” to add Image files into the PDF. -Click “Merge” to combine several PDFs into a single file. 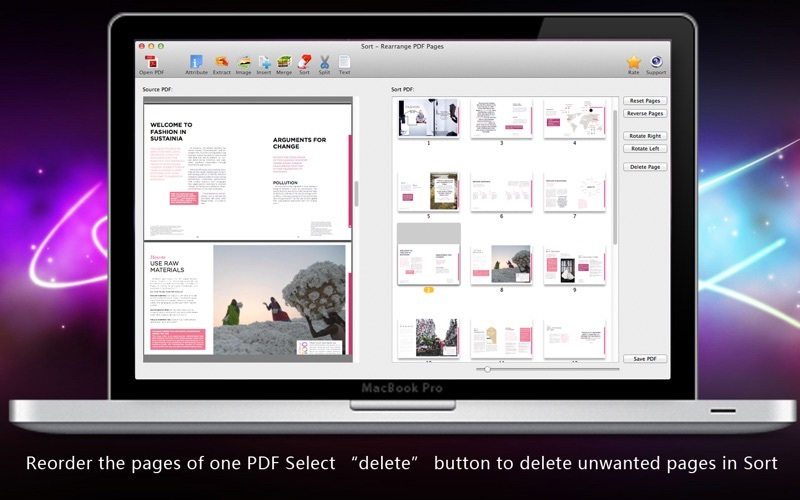 Drag& Drop to reorder PDF files in the file list. -Click “Sort” to reorder the pages of one PDF. Select “delete” button to delete unwanted pages in Sort. -- Click “Split” to split one PDF into two. -- Click “Convert” to change PDF into TEXT. In the Lite version, the daily edit number of files is limited to 5.